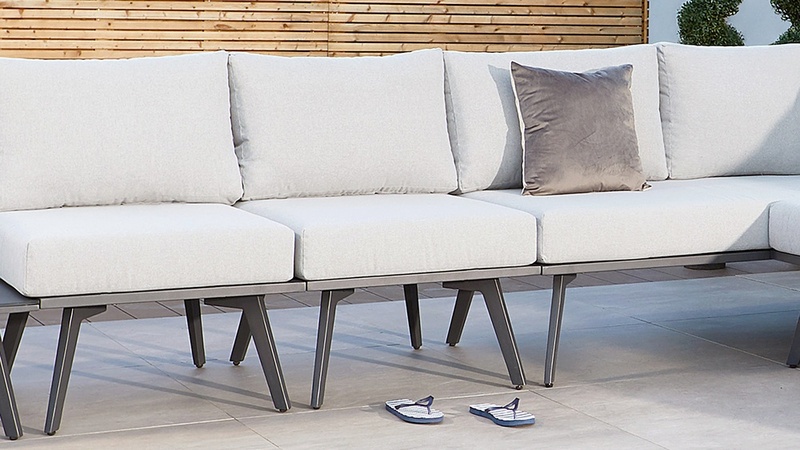 Part of our exclusive Bali range, the Bali Single Modular Seat would make the ideal extension to the corner bench. However, it is stunning standalone chair that can just as easily be set around a dining table or coffee table for an informal outdoor living space. 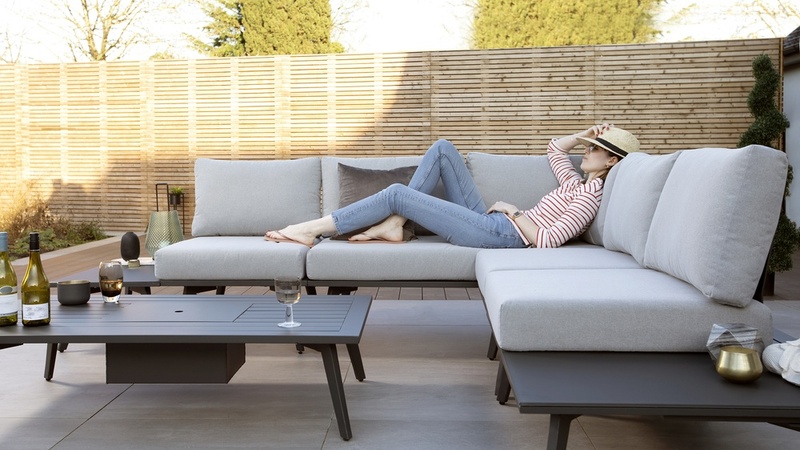 With comfy, generously sized cushions, treated with an anti-UV and showerproof coating, the Bali Modular Seat is ideal for garden use. The Bali Single Modular Seat is a modular unit, this means that you can change the configuration to suit your use. Arrange multiple seats around a circular table or alongside a rectangular dining table. 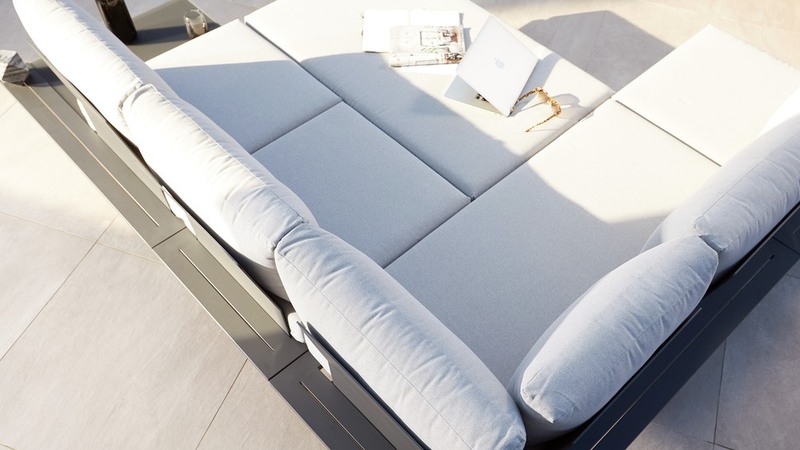 Alternatively, for a relaxing lounge zone, you could arrange the chairs in a linear bench style, positioned around a coffee table or footstool. As it’s a modular piece, the possibilities are endless. 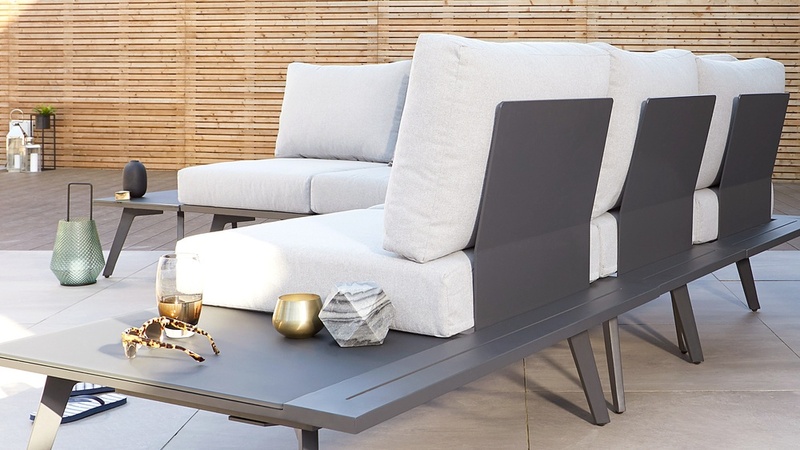 The Bali Corner Bench has simple, sleek lines, with the impression of a floating back supporting the sumptuous cushions. The cushions on the seat and back of this chair have been developed to provide the optimum level of comfort, that spring back into place and look great. To keep your cushions looking great we’ve ensured the material has been treated with a showerproof coating. This prevents moisture being absorbed into the cushions so you don't need to take them in every time there's a light shower. But we haven’t stopped there! In addition to a showerproof coating the fabric has also been treated with an anti-UV coating to help to prevent the colour from fading in the sun. 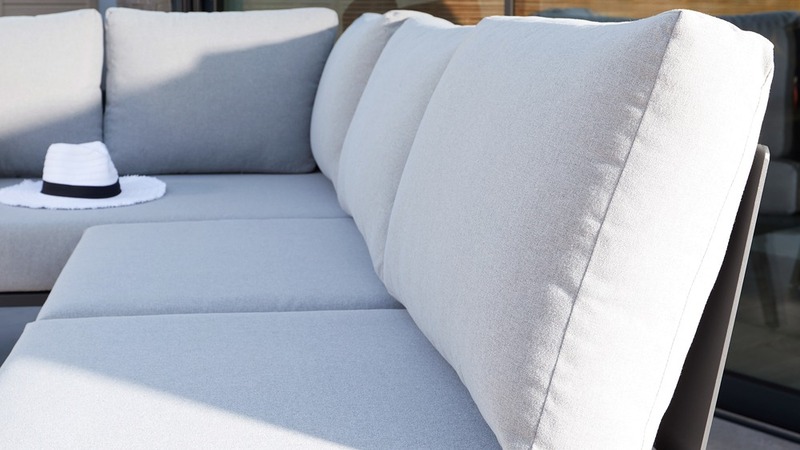 While most fabrics will fade slightly when exposed to direct sunlight, the anti-UV treatment slows the process drastically meaning your cushions will look great, for longer. The aluminium frame is finished in a grey powder coat, producing a sleek matt finish that's easy to clean and maintain. 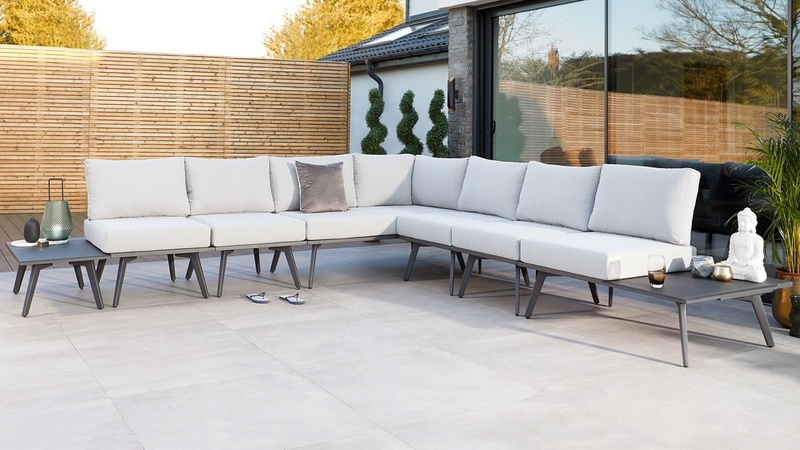 The grey powder coat can be seamlessly matched with other pieces of garden furniture, creating a timeless look that will last year after year. 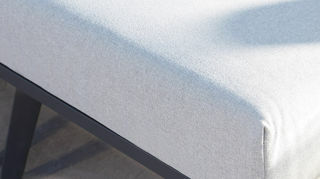 The base cushion has an anti-slip mat underneath to keep it from slipping out of place. This means you don’t need to keep adjusting the cushion and can sit back and relax in comfort. 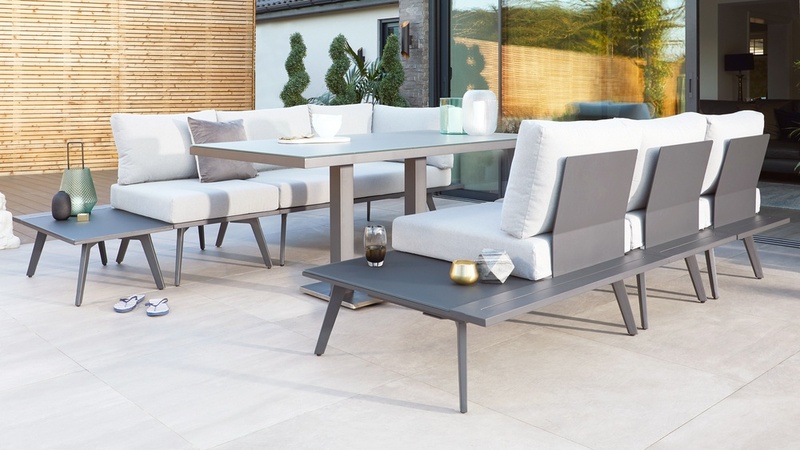 The Bali Single Modular Seat is part of the Bali range which includes the Bali Garden Corner Dining Bench and the Bali Garden Coffee Table with Ice Bucket. Combine the collection to create a sumptuous dining area or lounge zone.